It is important to keep records for each of your clients in one place and where you can easily access them. If you organize your paperwork for each client in the same fashion, it will be easy to find and file information. There are several ways to keep track of your client's records, and you can choose from electronic methods or good, old-fashioned paper and file folders. 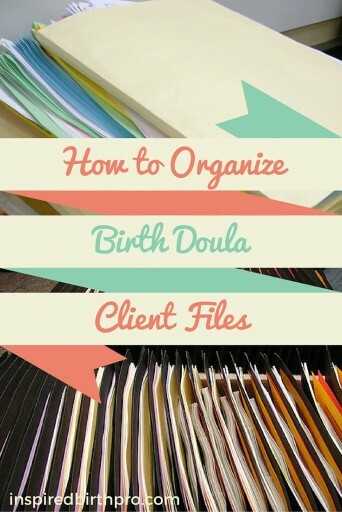 What has worked best for me is a paper filing system that has evolved over the years I've worked as a doula. Here are four steps you can follow to put your paperwork in order. I prefer top tab, letter-size classification folders with 2 partitions, like these. It's best to shop around online because they are a little pricey. In the past, I tried working with letter size manila folders and added fasteners to hold the papers in, but I needed more sections, and classification folders give me that freedom. You won't need very many. When you are done working with a client you can remove the paperwork, file it away and reuse the folder for another client. 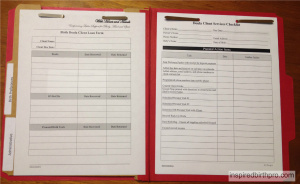 You will also need a two-hole paper punch so you can insert the paperwork into the folder. A label maker or file labels you can run through your printer are helpful. I think it looks more professional to have a printed label rather than a handwritten one, even if I'm the only one looking at the folder. 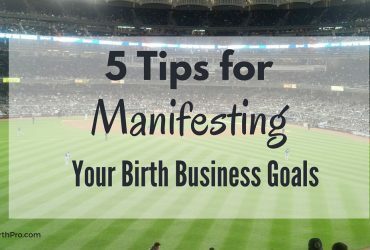 You can certainly have more forms that work for you in each section. Most of the forms I've mentioned are available in my Savvy Doula Business Forms Series and are available to purchase and download. 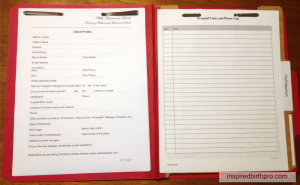 - The prenatal and postpartum paperwork, with the client-completed paperwork on the left side, and the logs on the right side. 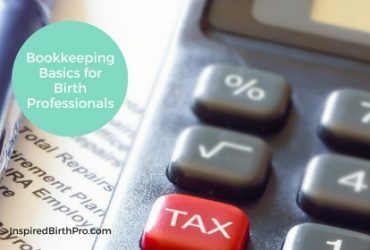 - The forms for labor and birth, again with the client-completed paperwork on the left side and the birth log and summary on the right. The client's birth preferences/plan will also go into this section once it's been completed. - The client loan form goes on the left side and the remaining forms on the right, with the Client Services Checklist on the top. I'll also print a copy of the map to the client's house from Google Maps and put it on the right side. Typically, folders for new clients start off with all the forms that don't first involve the client, like the logs and checklists. I usually email the intake forms and questionnaires to clients, and once they get those back to me I'll add them to the file. I store my client folders in a lockable file cabinet and refer to them as needed between prenatal/postpartum visits and the birth. I print a label for each client with their last name, then first name on it, and file them alphabetically. Once I am done working with a client, I'll empty the file, clip the paperwork together, and file them in a "Past Client" folder in my file cabinet. This system may or may not work for you. Some people like to keep all their clients' records in one three-ring binder. I worry that something will happen to that binder. For confidentiality reasons I personally feel it's better to keep each client's records separate. 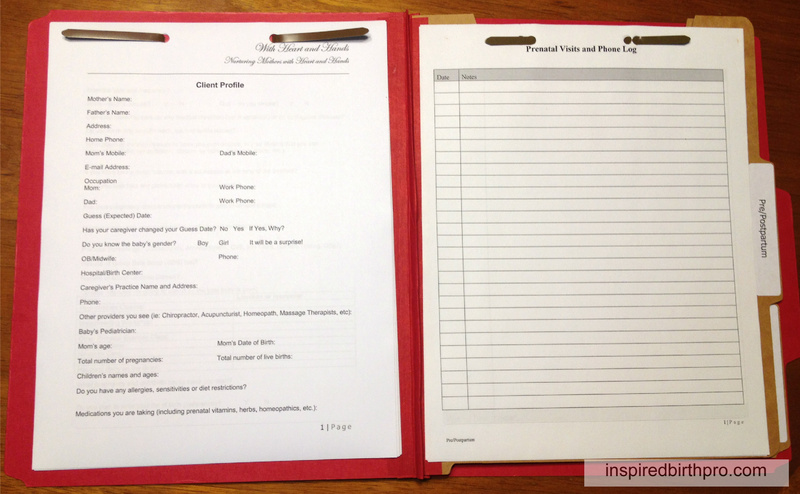 For a while, I used a 1/2-inch binder with subject dividers and kept one client's information in it. I later switched to classification folders because the binder was bulky to carry around. 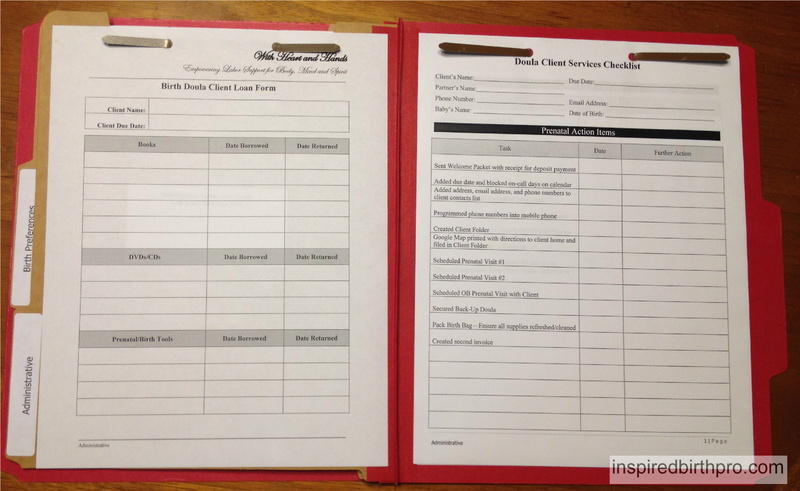 If you're in need of ready-made doula client and intake forms, You may find what you're looking for in the Inspired Birth Pro Store. Simply download them and customize them for your own practice. 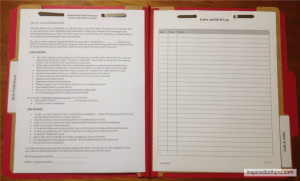 In addition to client intake forms, the Prenatal Meeting Planner is also available -- this set includes outlines, handouts and links to resources so you can develop and plan out your prenatal visits. How do you organize your client files? 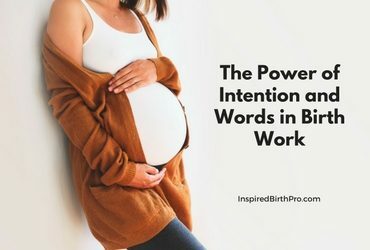 Tell us how in the Inspired Birth Pros community on Facebook, where we support one another in growing our businesses.